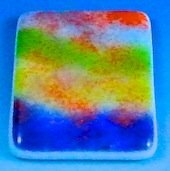 Make an enameled glass pendant by sifting enamel onto a white base and then firing in a glass fusing kiln. This enameled glass pendant is fully fused with softly rounded corners. After fusing, a low fire decal is then added and the item is then fired again at a lower temperature. Low fire decals are fired at less than fusing temperature to stop the decal burning away as no clear cap covers the decal. Decals come in black and white and colored versions, many of the decals used on ceramics are suitable for glass fusing. Some trial and error tests may be needed where it is unclear as to whether the decal is suitable for fusing. Due to their transparency, many decals need to be applied to a light colored base such as white. You can experiment with this as some base colors may enhance the decal colors. Dark glass may not be suitable as the decal details will be lost in the dark background. Some solid light colored images will work very well over a dark base. For this project, a solid white colored decal has been used over a glass enamel base. Select decal and measure, do not cut from sheet. Wash and dry pieces thoroughly. Stack pieces on a piece of paper sift selected colors onto the glass layers. Place on prepared shelf when completed and transfer to glass fusing kiln. Bring temperature up gradually to about 1460 F (793 C). If using thin fire paper keep kiln vented until the binders burn off and then close vent. Hold at around 1460 F temperature, watching for edges to soften and become rounded. The enamel should be smooth and nicely colored. You may need to adjust the glass kiln temperature to achieve the desired outcome. Switch glass kiln off, vent kiln and allow temperature to drop to about 1000 F (540 C). Close glass kiln and cool to room temperature. When kiln has cooled, remove enameled pendant from kiln. The photo below shows the fused enamel and the patterns applied. Measure glass again, it may have spread slightly. Cut decal from sheet and trim to size. Follow the instructions and apply to fused enamel. Place enameled glass pendant on prepared shelf and put in glass fusing kiln. Bring temperature up gradually to the decal makers recommended firing range. Turn glass kiln off and let it to cool to room temperature. Use sandpaper to roughen rear of pendant, apply bail to the glass with two-part epoxy. 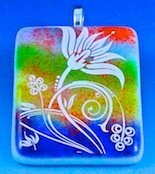 The techniques used in this enameled glass pendant project can be used in many ways, whether using decals or firing enameled jewelry pieces.